With Doctor Who hitting the headlines all the time at the moment, shops are eagerly awaiting the new toys from Character Options - I was out the other day in Kingston town centre and the big toyshop there has a sign apologising that they haven't managed to get the remote control Dalek in as yet ... 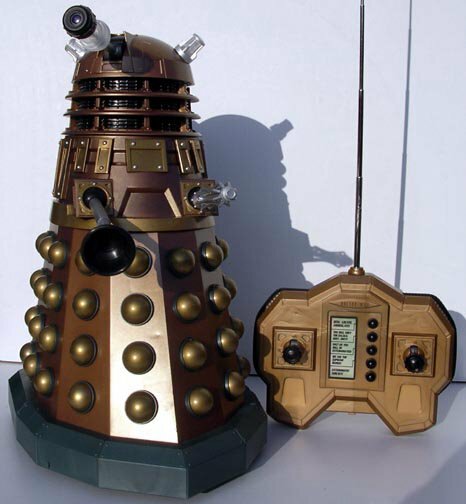 I spoke to them as well and it seems that demand is so high that they will only get 12 of the Remote Control Dalek! Looks like the predictions of Doctor Who being this year's 'must have' toys are coming true. I was lucky to receive a selection of the new toys a few weeks or so back and so have been giving them the once over. I'm pleased to report that they are, as a selection, brilliant. 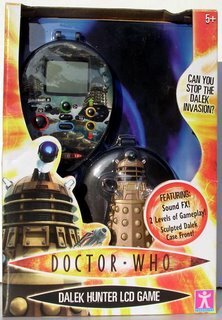 Ranging from the remote control Dalek to the Sonic Screwdriver there is something for everyone here. 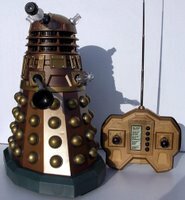 REMOTE CONTROL DALEK Starting with absolutely the Christmas must-have, the beautiful gold remote control Dalek stands a foot tall and comes with a neat rt unit which controls its movement. There are also buttons down the centre of the unit which make the Dalek say various phrases. The toy is fairly easy to control once you get the hang of it, although a polished wooden floor or kitchen lino would seem to be the best surface, and as it moves along so its head swings and the eye raises and lowers. The eye is also illuminated with that eerie blue glow and the whole thing is as stately as a tank as it chases cats, dogs or other family members around the room. 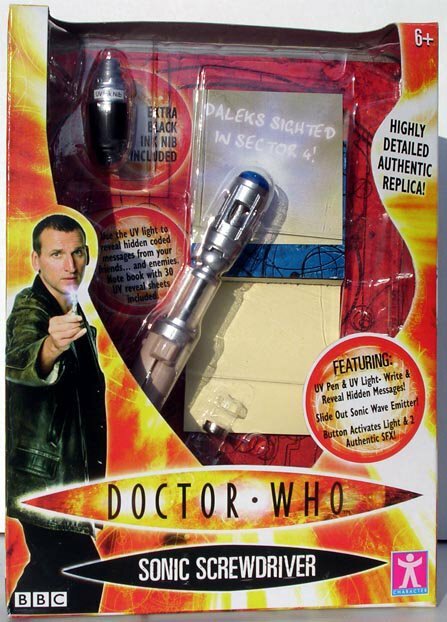 Everyone who has seen this wants one for Christmas ... SONIC SCREWDRIVER A nice replica of the Doctor's trusty tool from the TV series. This is made from plastic and has two buttons which make the end light up with uv light and the buzzing sound to emit. It also has a uv pen nib at one end (which can be interchanged with a black ink nib) and a pad of post-it type notes which can be written on. The uv pen is only visible under uv light so secret messages can be left for like minded friends. On the downside the toy is a little plasticky and the handle lacks the detailing on the original. Though I am told that this aspect is being improved for future releases. 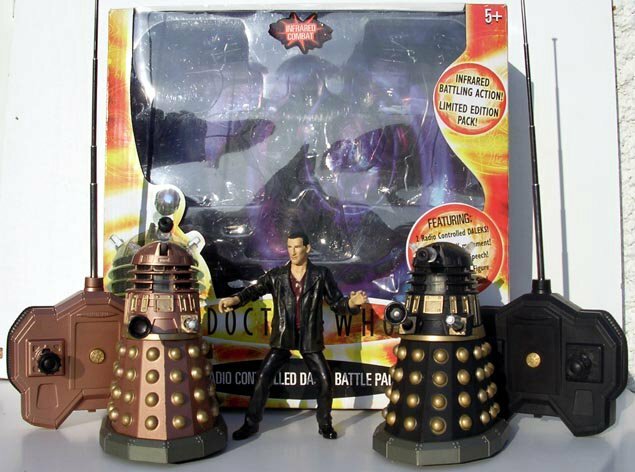 DALEK BATTLE SET This consists of two Daleks, a black and a gold, two remote control units and a model of either the Doctor or Rose. The Daleks, which are about 4 inches high, zoom around trying to exterminate each other and their lights flash faster as they are 'hit' until one of them 'dies' and switches off. Neat stuff though the set I have came with no instructions so I'm not quite sure how the thing works ... my black Dalek keeps dying before the gold no matter what. This is a fantastic toy and having Dalek chasing games around the dining room floor was brilliant. Top marks for this. TELEPHONE TARDIS A really neat idea, this. 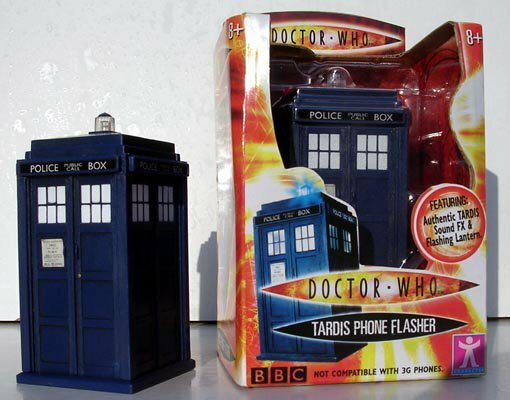 A small TARDIS model about four inches inches high on which the light flashes and the take-off sound is emitted when a mobile phone nearby is about to ring. Simple and effective. I loved this one. It's very cool. WALKIE TALKIES Large foot high models of the Doctor and a Slitheen hide walkie talkie handsets which can be used to communicate with friends. These are quite large and chunky and I don't like to break them out of their packaging to see how well they work. 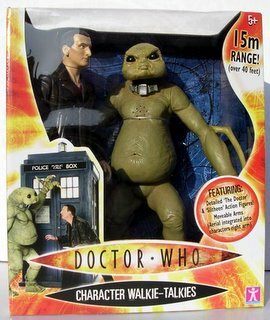 They are great models though, and it's really cool to see a monster other than a Dalek appearing as a physical model/figure for once. 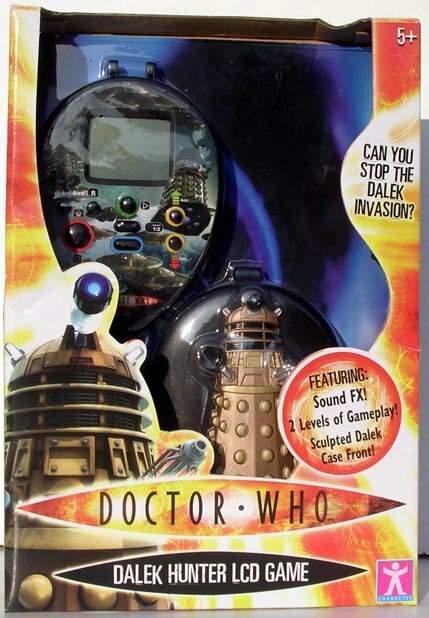 I wonder if the Slitheen farts :) DALEK LCD GAME A neat little LCD game which seems aimed at younger kids who haven't yet discovered the delights of PSPs and GameBoys as yet (does such a thing exist?) Nice Dalek packaging on this one. 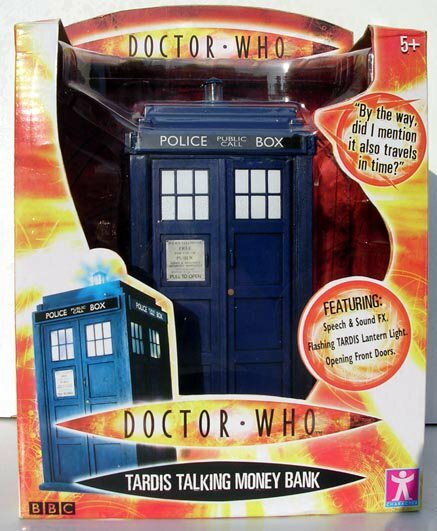 DOCTOR WHO MONEY BANK A TARDIS-shaped moneybank which speaks several phrases from the show when money is put in and the doors opened and closed. 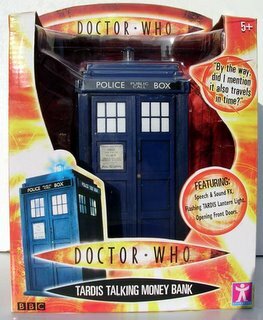 A rather nice idea to save up enough money to buy the other toys perhaps ... All the items have brilliant packaging and make a very consistent and attractive set of goodies from the show. Overall this is a fantastic set of toys with a few more goodies yet to come like talking mugs and the like. What an amazing time to be a fan of the show - we've not seen toys like these for many years and I hope we have many more to come over the next few years.